Here is a link to the abstracts. So readers can take a peek into just what excites RNA scientists. Enjoy. PS – just out of curiosity, does the name “Rustbelt” carry negative connotations for readers here? Just wondering. The announcement is here. The award goes to Elizabeth Blackburn, Carol Greider, and Jack Szostak “for the discovery of how chromosomes are protected by telomeres and the enzyme telomerase”. Needless to say, RNA is woven intricately into this subject. This is a follow-up of sorts to a previous essay on the subject of alternative polyadenylation. In the previous report, I discussed some bioinformatics studies that suggested that the 3′ UTRs of mRNAs change, in bulk, in the course of development in mammals. The implication of these results is that poly(A) site choice in mammals is regulated, with important functional consequences. A more recent study by Mayr and Bartel adds to this notion. These authors studied 3′ UTR length in normal and cancer cells, and found a striking correlation between 3′ UTR length and the expression of oncogenes. Specifically, higher expression (as is found in cancer cells) is correlated with shorter 3′ UTR. As 3′ UTR length is determined by the position of the poly(A) site along a transcript, this implicates alternative polyadenylation as one mechanism by which oncogene expression is activated. Carl Zimmer has a good article in the NY Times entitled “Where Did All the Flowers Come From?” The article summarizes lots of interesting stuff, but I find the speculation regarding the evolution of the endosperm to be particularly though-provoking. Of course, anytime one mentions genome duplication to me, visions of gene silencing and small RNAs begin dancing in my mind. A recent article from David Baulcombe’s group merits mention in this context. This paper describes a developmental study of RNA polymerase IV-derived small interfering RNAs (siRNAs). The remarkable finding in this paper is the observation that the synthesis of many polIV-derived siRNAs is initated at the onset of the development of the maternal gametophyte, and that these siRNAs are in turn derived from the maternal genome(s) in the endosperm. This has ramifications for the expression of the different genomes in the endosperm, for genome imprinting, and likely for the evolution of flowers and seed development in plants. Mosher RA, Melynk CW, Kelly KA, Dunn RM, Studholme DJ, Baulcombe DC. 2009. Uniparental expression of PolIV-dependent siRNAs in developing endosperm of Arabidopsis. Nature 460, 283-286 (9 July 2009) | doi:10.1038/nature08084. It has become more apparent in recent years that the different aspects of gene expression – transcription initiation, transcription elongation, mRNA capping, splicing, and polyadenylation, transport of the mRNA to the cytoplasm, translation, and mRNA quality control – are rather extensively interconnected. One corollary is that the polyadenylation complex, through various of its subunits, plays roles in various of these other processes. This has been established for the most parts in mammalian and yeast models, but some recent work in plants is adding new and important variation to this theme. A most recent of such studies has appeared online on PNAS. 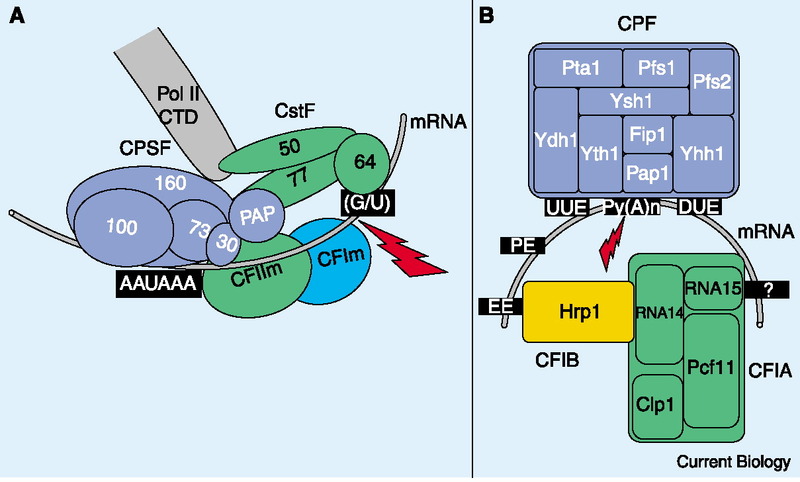 This study, from the lab of Caroline Dean, reveals that the polyadenylation factor subunit FY (a homolog of the yeast protein Pfs2), acting in concert with the flowering regulator FCA, plays a crucial role in chromatin modifications that regulate the expression of the FLC gene. Interestingly, this effect is not limited to just the FLC gene. Rather, other genes that are silenced by small RNA-mediated DNA methylation also require FY for this silencing. This provocative finding seems to place FY in some sort of proximity to the small RNA-guided DNA methylation machinery, and may have some relevance to many aspects of transcription and mRNA quality control. You are currently browsing the archives for the small RNAs category.